Susan's Disney Family: Givit is the easiest app to create, edit and share video in seconds on iPhone! 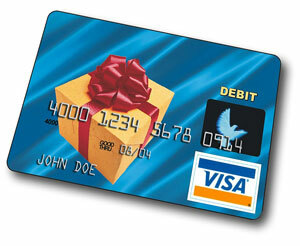 Win a $50.00 Visa Gift card. Givit is the easiest app to create, edit and share video in seconds on iPhone! Win a $50.00 Visa Gift card. A great easy to use app that helps to create, edit and share video in seconds on iPhone! Create Instant Video Highlight Reels with Givit for iPhone. 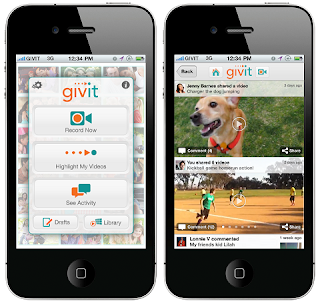 Givit is the easiest way for users to create personal video highlight reels on iPhone. Simply tap-to-clip the best of live or recorded video, choose effects and add music, and instantly share the polished video on Facebook, YouTube or via email. Givit is the first app that captures clips live as they are shot, removing the need for later editing and making video simple, fun and highly social. With Thanksgiving approaching, this time of year is a time to reflect, give thanks and savor memories of the year gone by. We can’t think of a better way to do this than with video, or an easier way to share that video than with Givit. So, to thank you for being a part of the Givit community, we are kicking off a ‘ThanksGivit’ contest – inviting you to submit videos that show off what you’re most thankful for and enter for the chance to win an iPad mini. The videos can be of anything – your kids, the new trick your dog just learned, the meal on your plate, your favorite new pair of shoes – anything that makes you happy and feel gratitude for what you have. *Tip – Try including multiple, Highlighted clips to create the best video possible. Also, check out the new ‘Live Highlighting’ features while you’re at it! Submissions will be judged on creativity and the best use of Givit’s Highlighting and effects features. ontest to win! I know I will be entering I would love to win! The contest runs from November 12 through December 7 so make sure to enter soon. To celebrate this great app, Givit will be giving Susan’s Disney Family readers a chance to win a $50.00 Visa gift card! Would you like to win? Please visit the Givit site, and tell me what you love about this app. *Official contest rules can be found here. One winner will win a $50.00 Visa gift card! My cousin would love this app. My niece would love this app. I would love this app! thanks for the headsup about it! My cousin would like this. What perfect timing for the holidays! This would go right in the gas tank. Thanks so much! My sis would love this! My sister would love this app! i would love this app!!! My sis and I would both love this app! My oldest daughter would enjoy this. Thanks for the chance to win! My daughter would use this a lot. My husband would love this app! My cousin would be all over this app - she's constantly shooting videos and photos and uploading them to social media sites and her blog! My cousin, who constantly shares videos, would love this! My brother would love it. Thanks for the giveaway. This app would be perfect for my sister. My sister would love this app. My friend who is always taking photos & videos of her 3 grandkids. my daughter would love this app! My sister in law probably would. I would love this app. Thanks! My mom would love this!! My daughter would love this app. My middle son would love this app. My oldest daughter would love this app. thank you! My sisters and I would like this app. My son, he loves taking videos of anything and everything with my phone. i would love this app and my husband would too! My whole family would enjoy this and all the apps. my daughter woulld love this! my GF would love this app.